Top left: a catch of Pacific herring. Top right: herring eggs on giant kelp (Macrocystis integrifolia). Bottom right: herring spawn turning the shoreline white. Photos by Caroline Fox (www.raincoast.org). Bottom left: herring in the rocky intertidal, photographed by Mike Yip. Pacific herring is a forage fish species. It grows to 46 cm long, has an elongated and laterally compressed body, and is silvery with a blue-green to olive green back. It has a deeply forked tail (caudal fin), no adipose fin, and no striations on its gill cover. Large scales cover the body but not the head or tail. Pacific herring is a schooling fish, and is found in nearshore habitats along coastlines of the North Pacific from Japan to the Bering Sea, and from the west coast of Alaska to northern Baja California. Its distribution also extends from the Bering Sea northeast to Bathurst in the Beaufort Sea, and northwest along the northern coast of Russia to the Lena River (see Aquamaps' probability distribution map.) Large schools tend to crowd into shallow bays or along shorelines, though they are found at different depths and locations depending on the season. Spawning occurs in sheltered bays on eelgrass and kelp. Herring may be seen as a flash of silver as they flip and leap at or near the surface of the water. Other small silvery schooling fish found along the Central Coast include the Pacific sardine, which has a row of dark spots along its side and gill cover striations; the northern anchovy, which has a large mouth and scales on the side of its tail fin; and smelt species (longfin smelt, Eulacon, surf smelt, rainbow smelt), all of which have adipose fins and are found in shallower, murky, and sometimes brackish waters close to shore, and some of which are anadromous. Herring schools are more commonly seen than most of these species; silvery fish flipping out of or near the water are almost always herring. Herring is the target of the largest commercial fishery in BC. While it was historically harvested for fish meal, today it is mostly used as baitfish and roe. 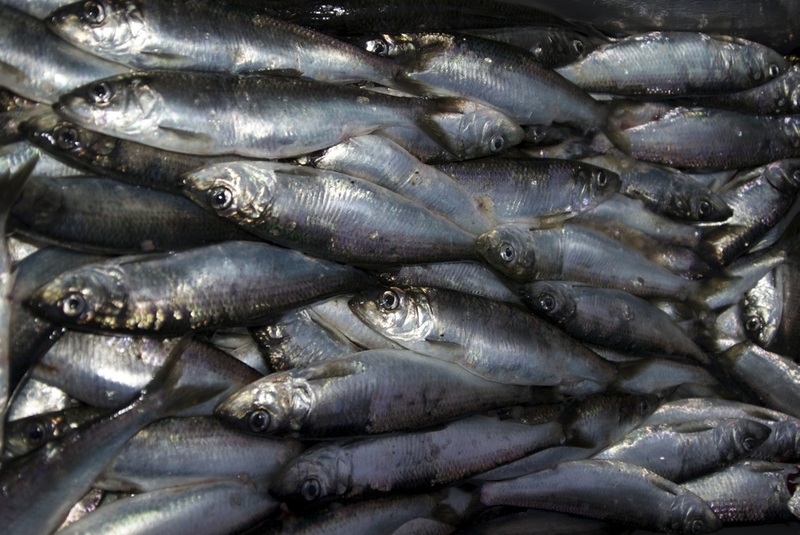 Pacific herring has a long history of use on the BC coast. 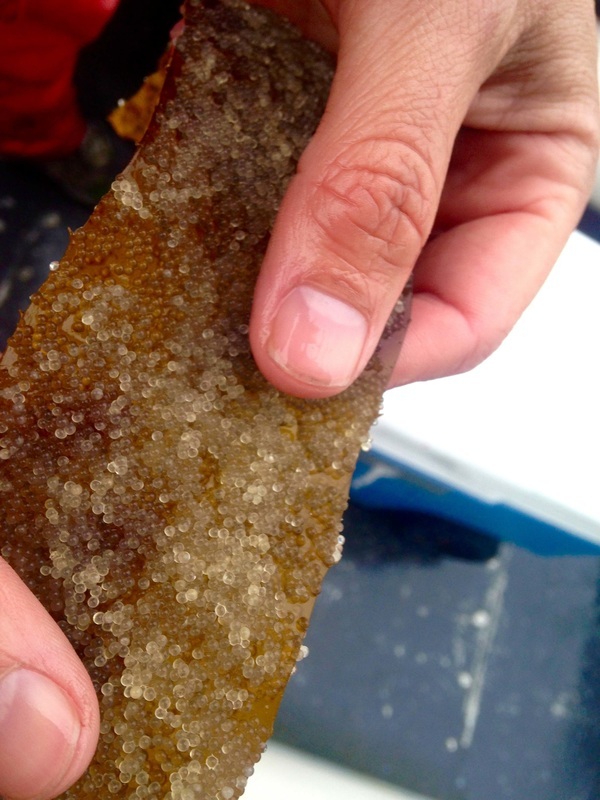 Herring and herring roe have been an important coastal First Nations food for thousands of years, and as such hold a large amount of cultural significance. 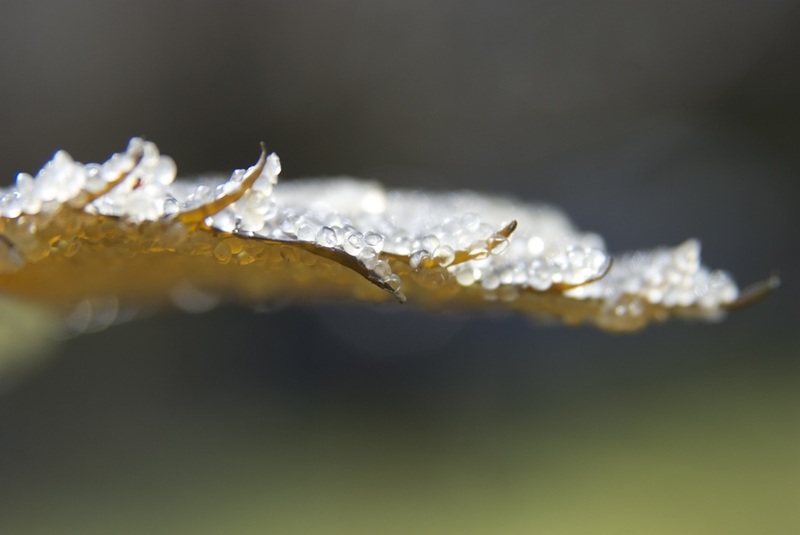 One traditional method of roe preparation is roe on kelp (or spawn-on-kelp). Roe on kelp is harvested locally along the BC coast, and is also prepared commercially as a specialty seafood product and is a valuable BC export. Click here to read a Pacific Wild blog post about harvesting this delicacy that looks like "an inside out piece of sushi." Herring is also eaten fresh, cooked, and pickled, and the roe is reportedly delicious poached and topped with vinegar or lemon juice (Lamb and Edgell 2010). ​Click here to see photos of an Alaskan herring fishery in action. Herring roe on kelp. Photo by Kaia Bryce. Each year, tens of thousands of tonnes of herring migrate from offshore waters to more sheltered nearshore bays and estuaries where they spawn en masse. Male herring release milt (containing sperm), which colors nearshore waters a chalky white, sometimes for many kilometers of coastline. In this opaque water, female herring lay eggs upon the intertidal and nearshore vegetation, which often includes eelgrass and kelp (Fox 2014). Research by Dr. Fox and Raincoast examines the relationships between herring and high-intertidal and terrestrial species, and finds that just as Pacific salmon provide a subsidy of nutrients and energy to coastal forest ecosystems, herring and herring spawn appear to be a significant contributor to high-intertidal and terrestrial ecosystems. See the Raincoast Pacific herring overview and this Raincoast press release for more information. 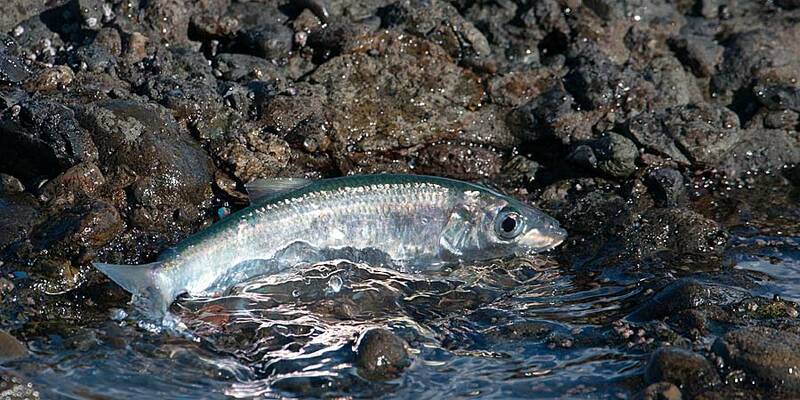 Conservation: Pacific herring populations have been heavily exploited for more than 50 years, and intense pressure on BC's five major populations results in frequent fishery closures along the coast. In late 2013/early 2014 three areas that had been closed to herring fishing for almost a decade due to conservation concerns were controversially re-opened; two were subsequently closed again, but the Central Coast fishery remained open despite concerns about population levels. Such tensions are indicative of how important herring are culturally, commercially, and ecologically. A major concern is the lack of recovery in areas that have been closed to fishing for years (and therefore have been released from fishing pressure). Why these stocks aren't recovering is not exactly known, though there are many possible factors including changing ocean temperatures, food abundance, increased predation, and increased competition. 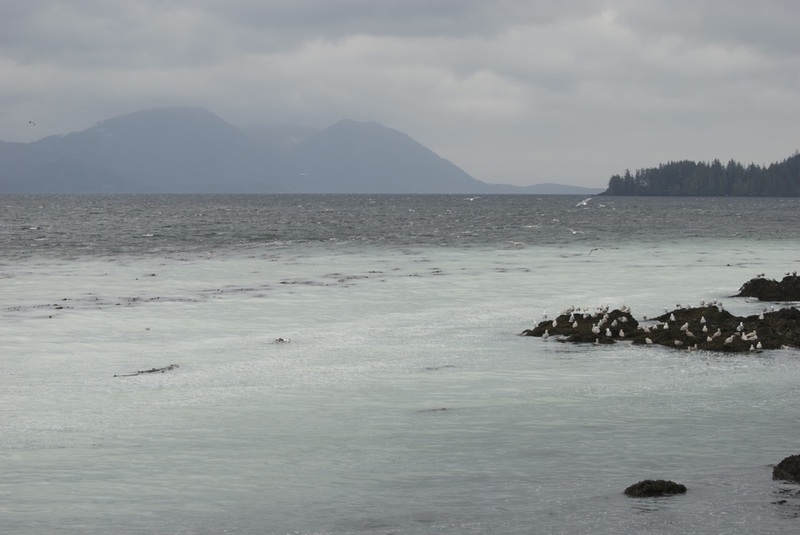 More information on the importance of Pacific herring is also available on the Pacific Herring website, which is part of the Tula Foundation's Hakai program. Binohlan, C.B. and Bailly, N. Clupea pallasii pallasii Valenciennes, 1847 Pacific herring. FishBase. Accessed 30/04/2014. Fox, C. Pacific Herring: Underpinning the coastal food web. Raincoast Conservation Foundation. Accessed 30/04/2014. Harbo, R. M. (2011). Whelks to whales: Coastal marine life of the Pacific Northwest. Madeira Park, BC: Harbour Publishing. P. 214. Lamb, A. and Edgell, P. (2010). Coastal Fishes of the Pacific Northwest. Madeira Park, BC: Harbour Publishing. Pp. 45-46. Wunsch, M. and Lepofsky, D. 'Causes of Change.' Facts. Pacific Herring. Accessed 30/04/2014.